Ambu® aScope™ 4 Broncho - AMBU INC. The single-use nature of aScope? 4 Broncho challenges conventions in bronchoscopy: It is always available, cost-efficient and sterile straight from the pack. The A-PEP ™ is an accurate, lightweight, and portable PEP therapy system designed to provide positive expiratory pressure therapy as an alternative to pursed lip breathing. Curaplex Chrome Plated Green System Handles feature cool, white illumination that improves view of larynx. Uses 2 C batteries, not included. Curaplex Macintosh, German profile has large 5 mm integral fiber optic bundle that provides more light, has a low profile, has no electrical contacts in the blade, and is Green System compatible. Curaplex Miller, German profile has large intergral fiber optic bundle that provides more light, no electric contacts in the blade, and is Green System compatible. The chrome plated brass laryngoscope handle is equipped with an LED lamp that provides an improved view of the larynx due to its clear illumination. Low power use prolongs battery life of the handle. Ambu? King LTS-D? 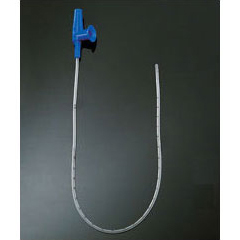 Disposable Laryngeal Tube Kits - AMBU INC. The Ambu? King LTS-D? Laryngeal Tube is a disposable, simple to use alternative airway device that provides superior patient ventilation. The King LTS-D allows the passage of the gastric tube through a separate channel. Modification of Wisconsin blade with a straight spatula. Designed primarily for infants. Wider tip, or break, better lifts epiglottis. King LTSD Tube Size 2 - AMBU INC.
Laryngoscope blade is built with an integral, extra large fiber optic bundle delivering a cool, white light. kING LTSD tube Size 2.5 - AMBU INC. The Curaplex Tracheostamy Tube Holder helps ensure a secure tracheostomy tube fit. Guedel Airways, Flexicare - FLEXICARE, INC. This set includes a quality endotracheal tube with an inserted stylet, saving time and storage space. aScope BronchoSampler, Sample Container - AMBU INC.
King LTSD Tube, Size 0 - AMBU INC.
King LTSD Tube, Size 1 - AMBU INC.
Curaplex Suction Tubing, 1/2 in x 6ft - BOUND TREE MEDICAL, LLC. ET Tube, Uncuffed, Murphy Eye 4.5 - FLEXICARE, INC.
Our comprehensive range of Endotracheal Tubes have unique features to ensure patient safety and comfort, allowing intubation with total confidence. Each individual tube is tested for integrity and safety. King KLTS-D, Size 1 Kit - AMBU INC. This set includes a quality endotracheal tube with an inserted stylet, saving time and storage space. The stylet has a low-friction coating to facilitate smooth withdrawal. Pertrach training kit includes 5 cuffed trach tube 5.6 mm, 5 dilators with flexible leader, and five 5 cc syringes.